There’s no doubt that watches are becoming very sophisticated and with many functions that the old mechanical models can’t match. Though one of the issues some folks have is that these new-fangled quartz/solar models are somewhat removed from more traditional models. (think of ‘G’ Shocks and ABC models). However that is actually not the case as the two models featured here illustrate. First is the Casio LCW-M170TD-7AER which looks pretty classic to anyone’s eye. But it is one of these highly technical models that we take as the “norm” these days. This one though is Analog with an Hour and Minute hand, centre seconds hand plus a small digital window that can show different functions, but can be set simply as the Day and the Date, which let’s face it, is about the most any of us actually use. The technical functions are Solar power, so no battery required – it also has Radio Control, so it always reads the correct time with Atomic Clock accuracy. It also sports World Time, so it can correct itself in 29 Time Zones throughout the world. It is a smart watch no doubt and despite the technology it’s easy to use. This particular version is Titanium cased, which I prefer for a couple or three reasons. It is not shiny (apart from the top bezel, which annoys me slightly), it is a brushed finish and it is incredibly light at around 77 gms. Unlike stainless steel polished cases this one does not show scratches and I’ve found over the years with other Ti watches, the Titanium takes on a lovely overall smooth finish which is rather pleasing. The electronic Module used in this model is the 5161 and it is used in a few Casio RC models. 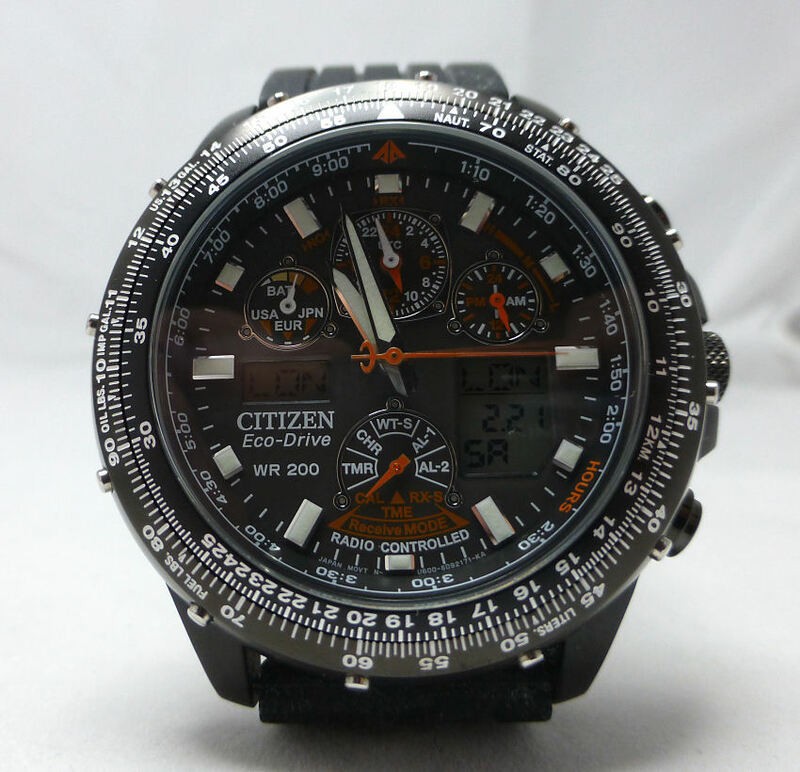 Not quite in the same league as my GPS Citizen CC3005-85E Solar, but it works very well and has a good reputation. Whilst Solar Powered and as everyone says – you don’t need a battery, it actually does have one. It’s a CTL920 rechargeable capacitor/battery, so don’t be tempted to fit a standard battery with similar dimensions! That’s not to say that if it gave up the ghost for whatever reason (rare indeed) you can’t change them, because you can and they are available from a good few battery suppliers. Although Casio say you should contact them for replacement, this is perhaps precautionary and for those who have no wish to delve into the back of a watch or maybe have sausages for fingers, rather than any technical reason. 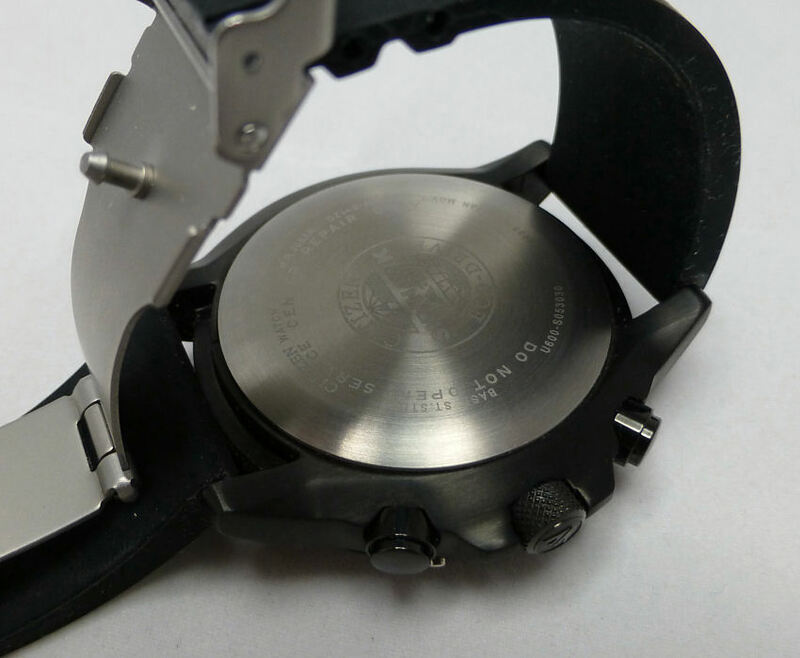 This model has a neat size of almost 40 mm diameter and just 9 mm depth so is slim on the wrist. The crystal is Sapphire so won’t scratch easily, though it doesn’t have anti-reflection coatings applied, which I would prefer to see as the almost white dial may not be as matte as would like. However on balance the hands have decent infill luminous properties and I have no great issues with reading the dial in most light situations. This model has a relatively modest Water Resistance at 50 m, so wet days, helping your wife do the washing up and showers are OK as indeed is the odd swim – just don’t start snorkeling. Overall I like this watch, its color scheme makes it dressy rather than sporty, so looks good for evening wear. It’s also in my “get it & forget it” category and very, very easy to live with. Full review – coming soon . . . . 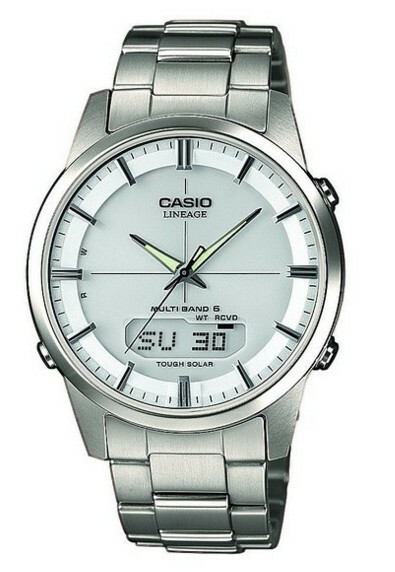 The second model I’m featuring is the LCW-M180D-7AER from Casio, which sports the same Module 5161 so technically the same, but this one is in Stainless Steel and whilst is has the light color dial it is configured slightly differently. Numbers 12 and 6 are represented by Roman Numerals and all numerals, markers and hands are in Gold tone against an off white coloured dial background. Whilst this might look quite rich or upmarket I always find with gold color hands, clarity is often an issue and in poor light I personally find them hard to make out. The luminous infill of the hands is similar though perhaps a little narrow, but I would judge night vision should be acceptable. The case however has a slightly different profile, Stainless Steel with a quite shiny finish, so may be too easy to show scratches. The bracelet is also in stainless steel and in a more pleasing link pattern than the LCW170. Note the Water Resistance is unchanged at 50 m.
Being Stainless Steel this model is some 40 gms heavier at 118 gms, though if it’s an issue you could lighten it considerably by easily changing to silicon or a leather strap as both models have a 20mm standard spring-bar fitting. As I said the operating Module is the same as are the functions, so it’s a personal choice on looks more than anything else. Both models are available in alternative versions such as black dial and positive or negative digital displays. For me personally, although I do like the look of the 180 and the fact is I’m looking for a light coloured dial anyway, I still have the feeling that I’d live more comfortably with the 170 Titanium version. Firstly owing to the finish and the light weight and secondly the dial has simple markers and a better hand contrast v the slightly lighter background. As readers of this site well know by now, clarity is a personal issue of mine and that Gold color just doesn’t quite do it for me. So there you have it. Two models, same Module, same amazing functions, yet cosmetically different enough to attract different buyers with different preferences. Both very Classic in their overall appearance and both functionally very good. These can be bought for between £180 and £230 here in UK and Europe, the case material being the major difference (Titanium being more expensive) and for that money the functions are pretty spectacular, yet refined. (I also like the fact that both models are not resin/metal hybrids this time, though that said Casio hybrids are great value for money). But these two are certainly not any old Day Date models and already are best sellers and I expect them to be so for quite some time yet. To some the concept of “Casio and elegance” may seem to be a contradiction in terms, yet they do have a model which to my mind just about manages to fit the phrase. 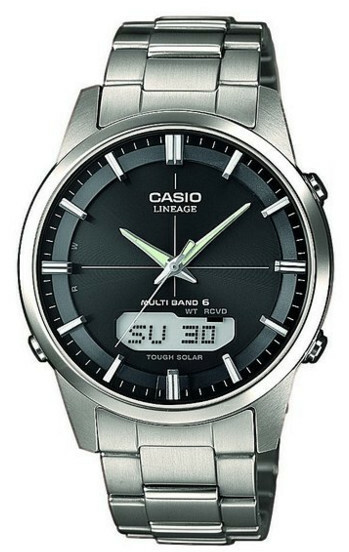 This is the Casio LCW-M170TD-1AER (the usual clunky code model number), part of the Lineage series and here it does describe a rather neatly specified and yes “elegant” model. In dress style form it is surprisingly well specified as it is both Solar powered, Radio Controlled (multi band 6) with a World Time* function and it’s Ana/Digi (with a center seconds hand) and with the emphasis on analog in looks, with just a neat secondary digital and on this model a positive display in the lower segment. A round solid Titanium light weight (80 gms) case with excellent dimensions of just 39.5 mm diameter and very slim at just 9.2 mm height, this is a sleek watch considering the complications. It also has a 5 bar Water Resistance (50 m) so can be viewed as a dress watch that doesn’t mind getting it’s feet wet. 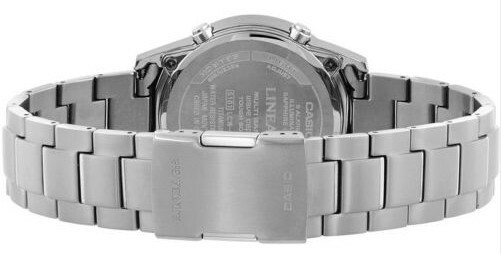 The crystal unusually for Casio is in synthetic Sapphire, so scratches are virtually eliminated and the pushbutton bracelet is also made of solid Titanium incorporating a twin push catch. The slight downside for me is that Casio’s Module 5161 is not the most up to date, noticeable in the *World Time function by the fact that only 29 City Time Zones are represented (the latest models feature some 40 zones) and omits Newfoundland, Canada (sorry guys) which has a UTC offset of -3.5 hrs – it won’t indicate that particular zone automatically. It has a 1/100 sec to 1 hr Stop Watch with elapsed time, split time and 5 independent Alarms, Auto calendar and an LED back light. The battery used is the CTL920 and there is a battery level indicator. The analog hands are luminous and the dial background is black though I note it can be slightly reflective at times, but that said it doesn’t seem to be an issue from the reports and reviews I’ve seen to date. I already noted that this version features a positive digital display and indeed of the 4 variations offered I believe it is the only one, the others being negative displays. I personally find it easier to see positive displays than the negative ones. I have to think this is maybe a slight departure for a Casio complication model, as they’ve managed to refrain from having it shrouded in Shock protection, nor is it oversize. And it does prove to me at last that they can easily squeeze the technology into a sensible standard sized dress style watch. This model also features a standard spring bar fitting arrangement for the bracelet, so if you fancy a change it’s simple to fit a standard strap should you prefer one. And that IS unusual for Casio today. So for those looking for a surprisingly well specified watch with all the mod cons complication wise you could wish for and within a dress watch style, this could be the one for you. A wolf in sheep’s clothing perhaps – and if you don’t like macho or flash, I think you’ll find this model rather elegant with it’s dress style looks – but PLUS a surprising set of functions hidden within. Elegance + – could be a good name for it instead of that big code? 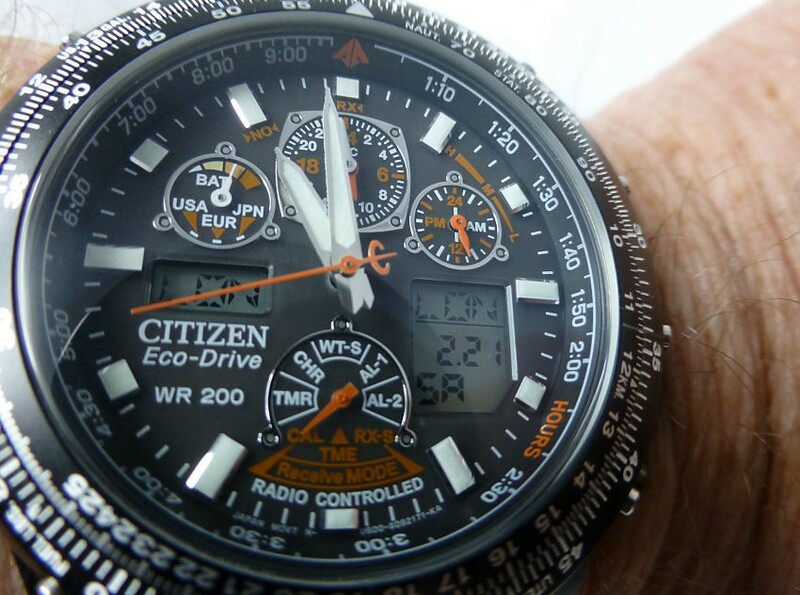 Note – Not intended as a true travel watch it is not possible to swap the analog time and the digital time (for another time zone for example). However it is quite easy if changing time zones, to change your home digital time to the destination time – the analog hands will move to the new “home” time, as they are programmed to indicate Home time by default. One thing Casio has certainly got going for them is their uncanny knack of making watches to suit everyone. And if you’re not a great fan of their “G” shock stuff, then what I call their hybrid plastic/resin & stainless/metalized look models could be for you. One thing is definite, they sport some great electronics, are easy to use, tough as any and make ideal “do everything” daily beaters. I actually have a “hybrid” model already, the Casio Tough Solar WVA-470, but more of this later as here I want to major on the Casio AQ-190W model shown above which is my newest affordable Casio to date. I like this for all sorts of reasons and not just the price, but for having none of the over muscular lumpiness and often less than easy to use pushbuttons of a “G” shock. This particular model is easy to use, easy pushers and easy intuitive functionality and reasonable dial clarity. As I said this is all at a very affordable under £40 price tag – and function for function is pretty decent value. 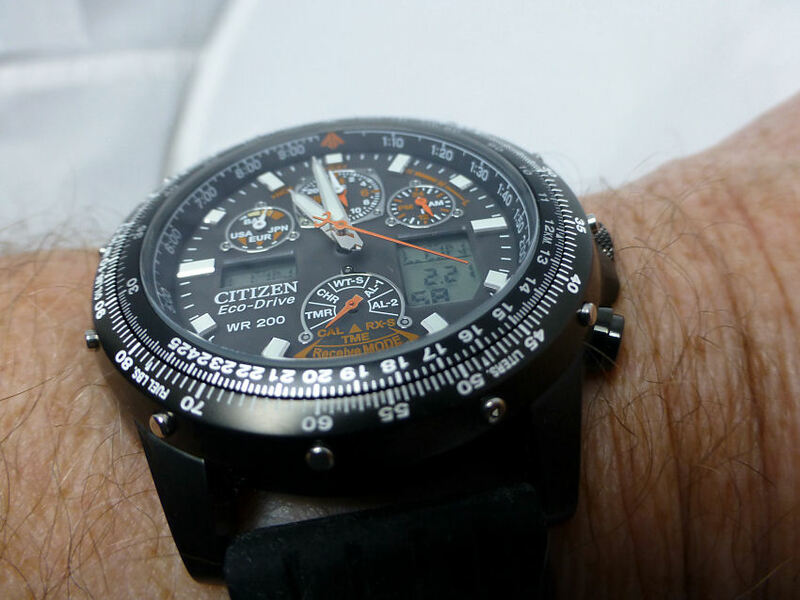 It has a Citizen Navitimer familiarity about the dial set up with it’s separate digital displays, and it functions in similar manner. The contrasting background layers, clear digits, contrast and clever use of tones makes this not too bad clarity wise, though the sub dial unfortunately is a little reflective – matte would have been so much better. As expected with Casio the feature list is long and mostly useful in this particular model and for those who like chronographs, the 1/1000 sec stopwatch analog counter is a bit special. The amazingly bright orange/yellow back light is at 3 o’clock and being just above the 3 marker, it reflects right across the dial and manages to illuminate both the analog hands and the digital windows which is a surprise. Certainly bright enough to read the time in the dark and maybe even to find your way to the bathroom at night! and certainly better than expected, especially compared to many other Casio models. Note that the analog hands and markers are also luminous and pretty decent in their own right. The World Time feature is about as good as it gets and again very Citizen like. This makes it really easy to adjust, without continual reference to instructions unlike some, so is a practical watch for travel. It’s easy to set the time or to select another Time Zone or indeed change from your current time to destination time. As the digital and analog times are linked, you first select World Time and set the destination Zone you want, then “Swap” the digital time you’ve just set on to the hands – simply by pressing buttons A and B at the same time (that is the two upper buttons ) and the hands immediately move quickly round to the new digital setting. Your previous analog time will now show on the digital screen. On your return journey again select World Time, press both buttons A & B simultaneously again and job done – the times will revert once again. Very simple in practice. However whilst the functionality of this model is commendable, the quality of the band is let down by its rather sharp edges, which can cut into the wrist slightly and this is a real shame. I say this as in another respect the bracelet is good, specifically in that the band fits to the watch case via a standard 18 mm spring-bar and is not a molded Casio only affair. Because of that you would think that it could be changed for a standard 18 mm wide strap or bracelet. Well it can but it’s not quite as easy as it sounds and in any case you really shouldn’t have to, and that’s the point. The reason for my caution here is that whilst the spring-bar fitting is 18 mm, the actual width of the bracelet at case is around 24 mm, so an 18 mm strap will look much too small in proportion to the watch. I managed to get round that by fitting a modified 24 mm silicon deployment strap, which wasn’t too difficult to do and it looks absolutely fine (when I get a photo of it, I’ll post it here). The watch now has the comfort it should have had at the start! However bracelet apart in terms of price, functions, features, intuitive ease of use, size, weight and style, this is a very good buy and it even manages a 100m Water Resistance as well – So it’s got quite a lot going for it. A friend of mine has a rubber strap version of this model he picked up in India, where it seems to be very popular (Oh had I known!). I’ve done a brief comparison of my two Casio hydrids, and if pushed I’d have to say “out of the box” the slightly more expensive WVA-470 Waveceptor is my preference. My WVA-470 Waveceptor (Radio Control), Tough Solar, World Time with it’s 5053 module overall has more to it and has slightly better build quality including the bracelet (though is Casio fit only) and functionality is good. For travel you basically have to set a new Home Time, but that said, it’s actually very easy to do – press button A (top left) to first see the transmitter selection, then toggle button C (lower left) to the City code – once selected press button A twice. The hands will move to the new Home Time, so pretty fast and easy to manage. It’s a deceptively simple and understated looking watch and it’s also very comfortable to wear and use. The AQ-190W model (module 5082) featured here doesn’t have Solar or Radio Control, but does have good functionality, especially regarding the World Time feature – and I like the fact you can instantly “swap” any digital Time Zone to the analog hand indication which is perfect for traveling. Whether the 1/1000 sec chronograph is a good thing depends on personal preference. Personally I don’t need that accuracy. 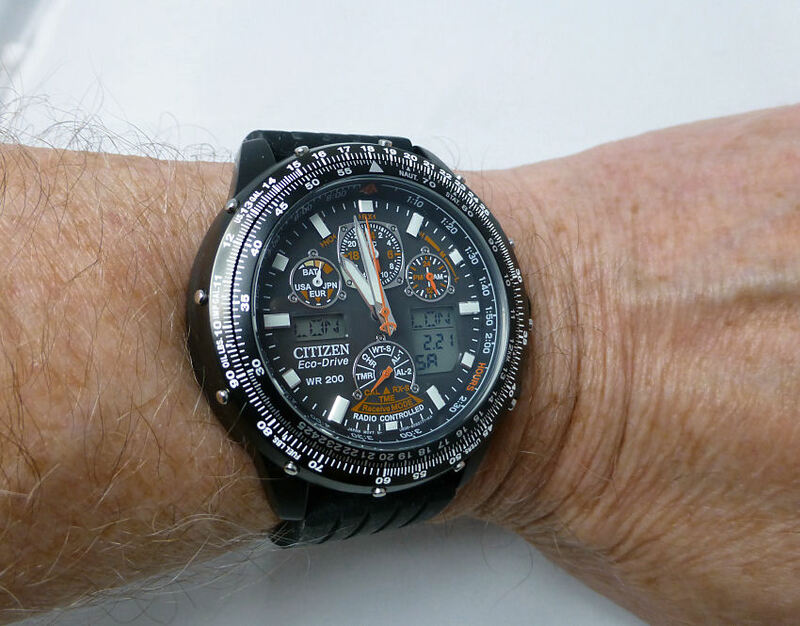 Any downside – The sharp sided bracelet is really inexcusable from Casio and whilst a strap could used in place, this is hardly the point. Also after wearing this model for a while I note the Gray color hour and minute hands, in certain light can disappear into the display background. These would be much better White. This is something that I didn’t expect, but noticeable after use for a bit and whilst not a sale breaker, being a stickler as I am for clarity it’s a little disappointing. 24 mm wide alternative Silicon deployment strap – fitted to 18 mm spring-bars. As regards Analog/Digital models I was starting to think these were on the decline – but far from it. 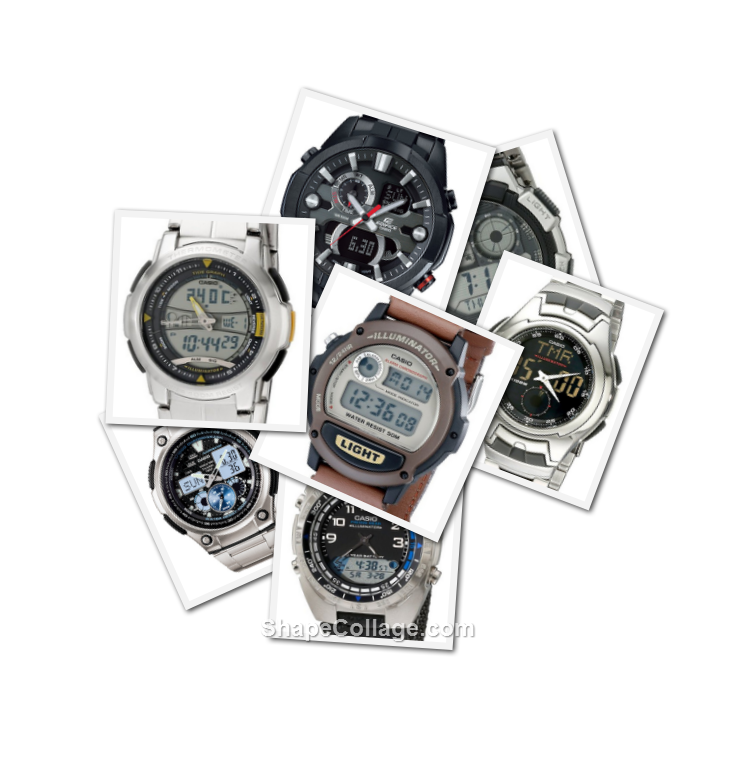 Casio alone have literally dozens of variations on a theme, from the more expensive right down to the incredible under $20 models and each with varying degrees of functionality. It’s a mark of their remarkable strength in depth that almost all of them are pretty good with just a different emphasis here and there as to the actual featured function. Unlike their resin cased range, where Casio’s quality is probably unsurpassed, the composite build cased models are a different matter. 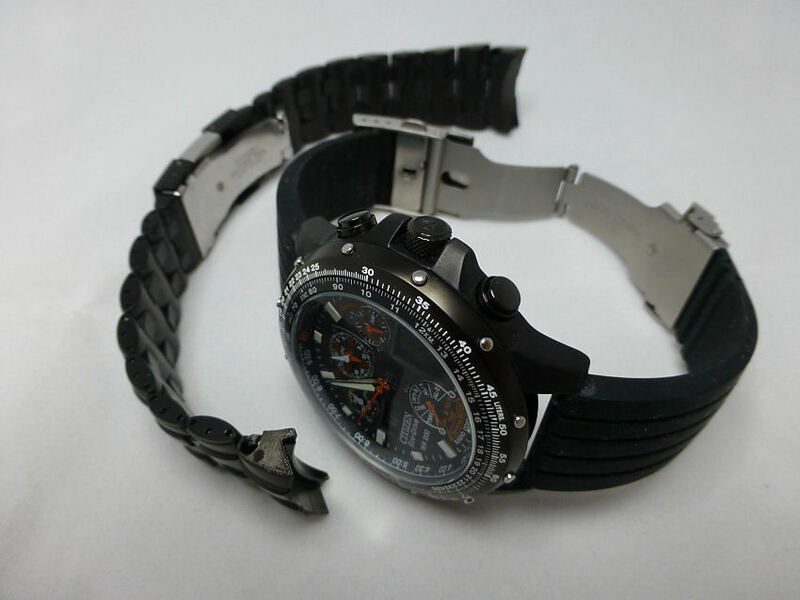 You really do have to carefully check build quality, as seen here with the AQ-190, whilst the watch/case etc is fine, the bracelet is not so fine. And it varies with each model and perhaps influenced by where in the group a particular part of the hybrid make up was produced and/or assembled. Some like the WVA-470 for example are about as good as you’ll get and yet model wise only marginally more expensive than the other. There’s no question in my mind and fortunate for my wallet, that in general with Casio, I find the low to mid range priced models represent best value. I invariably find the more expensive range such as Edifice and above in comparison do not. The model featured in this Post and more so with it’s pal hybrid Waveceptor model represent good affordable value. Also getting away from the grey resin only cased models, I like the look of the composite resin/steel case structure, which certainly reduces the overall price point and they are each a sensible size and whichever one you prefer in this Post, both have exceptional functionality. 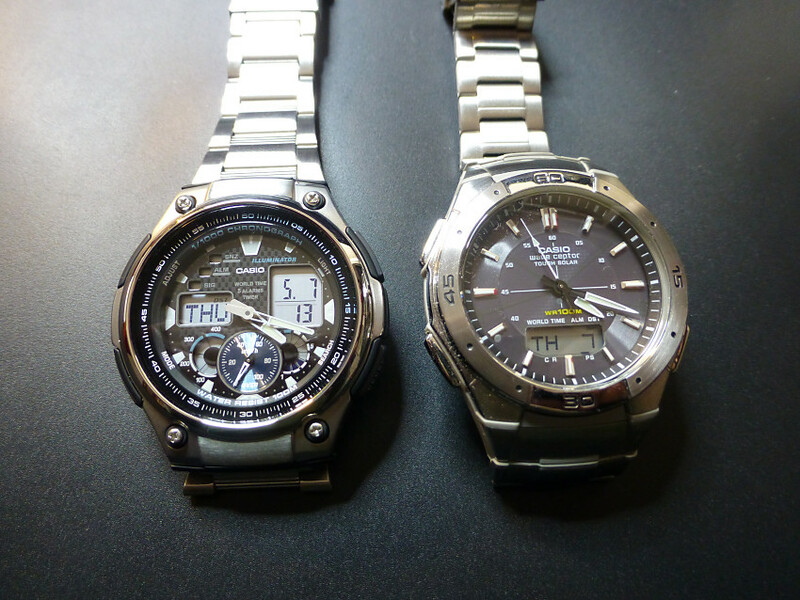 And they are two of a wide selection from Casio that manage to get the balance just right, and yet I also note are rarely if ever advertised highly. Casio’s marketing hype tends to be geared towards their more expensive models, which I suppose is par for the course. But don’t be fooled. 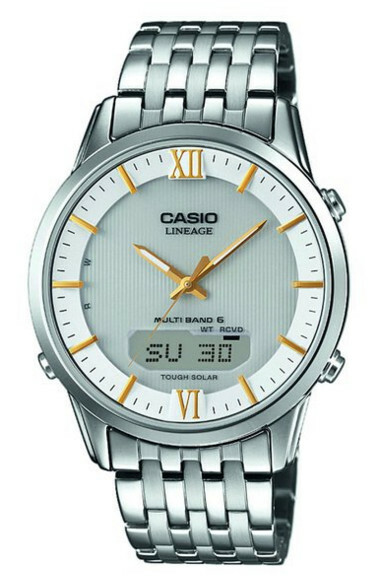 Really good value Casio models are there, but usually just under the radar and you may have to actively seek them out. But if you do, I can almost guarantee you won’t regret it. 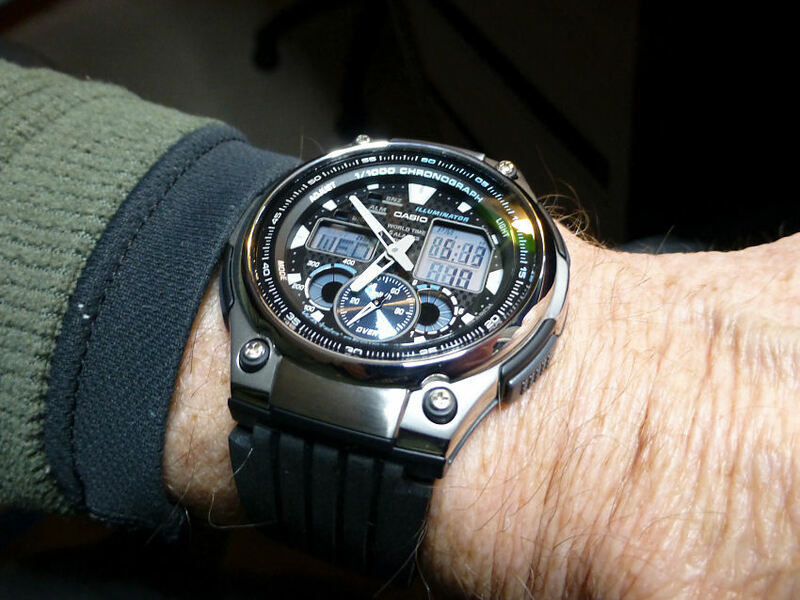 Note – The WVA-470 Waveceptor,AQ-190W was featured here in my “Watch of the Week” as it still represents a great value watch. 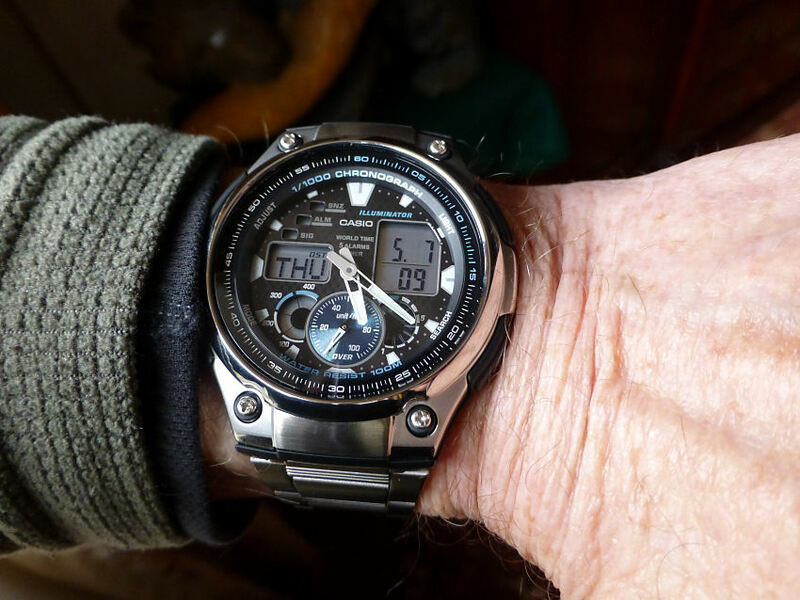 I also note there are quite a few variations of this watch (mine could be replaced by now) such as the WVA-105H, the WVA-M630D, the WVA-M640 to name but three . . . . so it appears it was and is still a winning combination and popular.